After years (and years and years …) of raising the aquatic invasive species (AIS) flag a disparate, but coalescing group of individuals, organizations and advocacy groups are now poised to bring the AIS threat to the fore. The Lake Minnetonka Association (LMA) is one of many voices being raised around Minnesota who are demanding more resources and action be taken to protect and manage our lakes. It is finally beginning to feel like we have a critical mass to call attention to the fact that AIS are ruining our lakes. • The Minnehaha Creek Watershed District has proposed a plan amendment to address the AIS threat within the Minnehaha Creek watershed. • On January 15th, the Tri-County (Hubbard, Becker and Ottertail Counties) AIS Legislative Summit was held for legislators in the Detroit Lakes area to hear from lake associations and watershed districts that something must be done to protect their lakes. Over three hundred attended. • Prevention and control of aquatic invasive species is one of the top priorities of the Minnesota Seasonal and Recreational Property Owners. Their lobbyist will be advocating for new AIS laws and funding. • Minnesota Waters and the Minnesota Department of Natural Resources (MN DNR) organized and hosted an expert forum in November 2010 to hear their views on how invasive plants, like milfoil, curlyleaf pondweed and Flowering rush (all in Lake Minnetonka) can be better managed and controlled. I was a co-moderator of that forum. A second follow-up forum is being planned for next month. • The Green Lake Association (Spicer, MN) has begun a fundraising campaign to retain a legislative lobbyist and have asked other prominent lake associations to join their effort. To-date, they report having raised in excess of $15,000 from their members. o Increase in enforcement of AIS laws. o Increase the penalties for violation of AIS laws. o Improve the AIS inspection process. o Aide AIS actions at public accesses. o Require lake service providers training. o Focus on AIS super spreaders and prioritize. o Increase funding for AIS efforts. 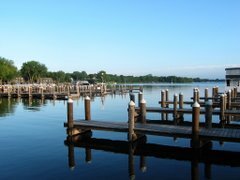 The Lake Minnetonka Association has played a significant role in all of these because we believe Lake Minnetonka is woefully under-protected and changes at the local and state level are needed. It is clear that lakeshore owners’ associations are leading the way in Minnesota. In addition, some watershed districts, like Minnetonka Creek and Pelican River, are also assuming leadership roles to protect our lakes. AIS action recommendations have recently been framed as an ‘us versus them’ scenario where lakeshore owners have been pitted against other lake users. This is unfortunate, inaccurate and unproductive as all lake users’ interests are to protect the lakes they love. This ought to be more appropriately framed as ‘us’ (all in Minnesota who love our lakes) versus ‘them’ (AIS that threaten to permanently damage our lakes). It is now clear to a widespread and growing constituency that the status quo must be changed if we are to protect and restore our lakes. the source. Thanks for your time. in the domain name: http://www.blogger.com/comment. it? You did! lol j/k. I was about to shop for this domain name but noticed it was taken so I thought I'd come check it out. Nice blog! was almost moved to start my own blog (well, almost...HaHa! Lake Minnetonka Association to be certain you get the correct anchor text.